When I decided to leave Cordon Bleu early, I erased the marks on May and June. I created two fresh, blank pages. Just before I made my final choice, I compared diaries with mum. She discovered a chunk of holiday sandwiched between the winter and summer seasons. So we decided to go on a trip. California quickly established itself as the destination. So you'll find us on a flight to Los Angeles at the beginning of May. Seven weeks later, we fly out of San Francisco. At the moment there's no fixed route or timetable - just a scribbled list of places to eat, people to meet, sights to see and a general direction for our little rented campervan. Have you got any must-not-miss suggestions? We'll eat almost anything as long as it's not very spicy (and I have an irrational dislike of anchovies). One of the places that I want to visit in California is Chez Panisse. 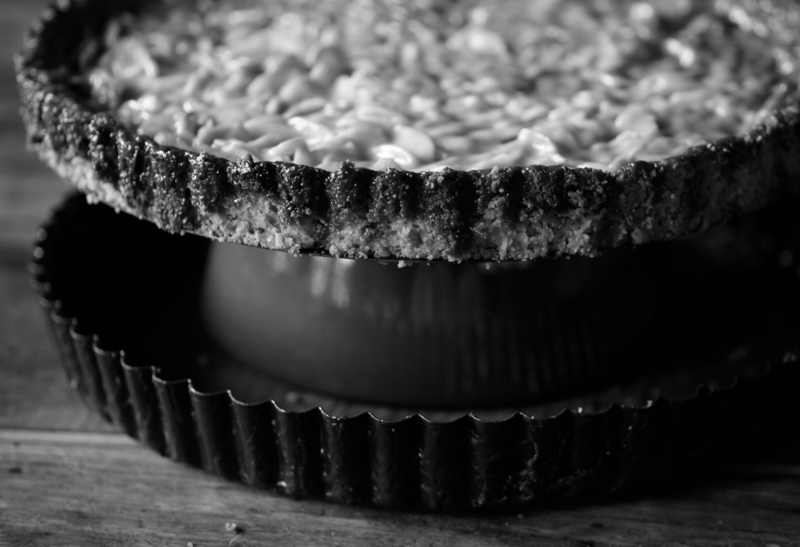 I've had one of their signature recipes - this almond tart - bookmarked for years. It seemed like the perfect time to finally give it a go. It's an unusual recipe - you press the room temperature pastry into the tin with your hands. At the start it looks like it'll never be even and neat (see above...) but it does smooth out in the end. The result is a crumbly, buttery, almost shortbread-esque bottom layer of the tart. The filling - described beautifully in the book as "creamy-and-russet caramel" - perfectly tightropes the line between chewy and gooey. It surpassed my high expectations. There's no need for cutlery, cream or fruit. This is something to eat with your hands. It would be perfect for a spring picnic - the pastry might delicately crumble around the edges but otherwise it travels well. You can find the recipe in Chez Panisse Desserts by Lindsay Shere. It's such a pretty book, sprinkled with Wayne Thiebaud illustrations. You can also find a slightly different version of the recipe on David Lebovitz's site. I used both to make this tart. 1/ You can play with the dough quite a bit when you're lining the tin. 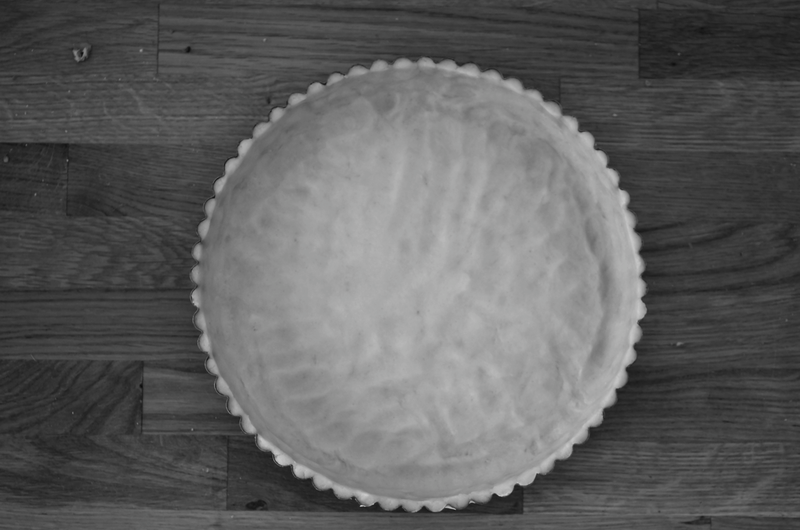 As mentioned, keep a bit of extra pastry at room temperature and smear over any tiny holes/cracks after baking - be careful to not press too hard as it'll crumble. I totally froze my shell after I'd lined it - you don't need to blind bake, just put it straight in the oven. Keep in mind that it won't cook the second time so the pastry needs to be well cooked. 2/ I didn't have any almond essence so I didn't use any in the pastry or filling. It was still absolutely lovely. 3/ Be careful how much filling you pour in - mine bubbled up and over when I put it in the oven. I still had a little leftover. Lindsay mentions leaving the filling for 15 minutes before filling the shell and baking - I was in a hurry so didn't. The leftover bit thickened quite a lot in that time so it might make a difference. 4/ Getting it out of the tin is a pain. Mine didn't stick on the base (as happened to Adam) but as the filling flowed over, the sides stuck. I used a knife to push the sides away from the tin while it was still soft then pulled the tin off when it had firmed up a bit more. It didn't look pretty and crumbled a lot but hey - still tasted good! We're doing a similar trip in August/September so I will be very interested to hear what you see and do while you're in California! Chez Panisse is definitely on my list too. I made this tart last year and it was amazing. Really delicious. Could you please give us your recipe? london bakes - Sounds great! I'll be sure to pass on anything we learn/love. Coconut and Vanilla - It's wonderful, isn't it. Well worth trying! sarah @ two tarts - Thanks! It's quite hard to describe - but so good. Anonymous - As I didn't change anything in the recipe (apart from the bits I noted), I've just given the online source above. Hope that helps. I know San Francisco very very well, and a good friend of mine was a pastry chef there for many years. I have loads of suggestions of favourite places (both mine and hers); please feel free to email me at skimwilk (at) yahoo (dot) com. Have a wonderful time! I was lucky enough to go to California twice last year. I can highly recommend Sofi's (Greek) restaurant in West Hollywood. Their patio is a real charmer at night. Also, the restaurant in the Geddy Museum, (amazing food and views) and the Ivy in Bev. Hills (you might see a celeb or two!). In Los Olivos, Los Olivos cafe and wine merchant, in Santa Barbara Brophy Bros. (seafood on the harbor), and Bistro Jeanty in Yountville (where their tomato soup is to die for). Man, those were some great trips. Have fun! I've been eyeing up this recipe on David Lebovitz's site for over a year - really need to get around to making it as it looks insanely delicious. Hope you have an absolutely wonderful trip over the summer, it sounds incredible. That is the tart of all tarts to us Berkeley folks. Yum! Emma, I'm so excited you are taking this trip to California. And Chez Panisse is a must - eat at the cafe, not the restaurant. It's much more relaxed and the food is just as good. I hope to see you when you're here. If you make it to the LA area (or just need suggestions), please be sure to contact me [gareend@yahoo.com]! I am the resident foodie in these parts (self-proclaimed) and would love to share a meal with you. I would recommend travelling to Big Sur and checking out the Big Sur Bakery (http://www.bigsurbakery.com/) or Nepenthe (http://www.nepenthebigsur.com/). You will enjoy the scenery and the food. Have fun! Susan - Thanks Susan, I'll be in touch soon! Liza in Ann Arbor - Wonderful, I'll pop them on our map&list! Thanks for the help. thelittleloaf - Try it! I'm so glad I finally got around to making it - just wish I had tried it earlier! Erin - I bet it's even more delicious when made and eaten there :) Will keep in touch re. meeting! Gareen - Great, thank you! Will be in touch soon. This looks like it could be quite a pastry adventure. As is your trip. I have a date in June booked in my diary to book my spot at Chez Panisse in July as we head back to the UK to see family and friends. I hope you'll give a full report on your trip so I can piggy back on your recommendations. You should eat at a taco truck in LA - there are lots to choose from. Watch how the others order first: it's usually yelling, grabbing, adding (often spicy - watch out!) condiments, eating, then paying. It would be a cultural experience. In San Francisco, Tartine Bakery is renowned. Of course, there is the Napa Valley with wineries as well as famous restaurants such as The French Laundry and Mustards. There is also a lot of natural beauty in CA. I recommend Joshua Tree National Park and Mono Lake - they are unique. There is also Death Valley. I made your Guinness cake for St. Patrick's Day and it was very well-received. My 3-year-old can't stop talking about the chocolate cake with white frosting. So lovely -- and what a trip you're headed for! It's worth it to take a detour south to Chino Farms near Rancho Santa Fe on the way to San Diego. While you're there, you can have lunch at Market in Del Mar and take a walk on the beach at Torrey Pines. It's truly beautiful and you won't regret it. Gosh, it sounds like an exciting (and luxuriously long) trip, how exciting! While I'm not terribly familiar with the LA area, I grew up in the Bay Area (in Palo Alto - right near Stanford) and have lived in San Francisco for the past 3 years, so I have PLENTY of recommendations for sites to see/places to eat. Here are a few recommendations/highlights depending on what you’re looking for (unless noted, these are all in San Francisco proper): Hong Kong Flower Lounge for fantastic dim sum (get the taro cake, chicken wings, shu mai, and bao especially); Mission Beach Cafe for a hearty brunch and pie (don't leave without a slice! get it to go if you're stuffed); Outerlands for beautiful food and cocktails by the beach, also check out Trouble Coffee Company and the General Store next door if there’s a wait at Outerlands (there almost always is, but it’s absolutely worth it); NOPA is overall just fantastic and has exceptional service, also they have unbeatable cocktails and a great wine list, they're also open late - they serve food til 1 AM; Cha-Ya for unpretentious vegan Japanese food (way better than it sounds – really, don't skip this one, I’d recommend their tempura and the dengaku especially); The Ice Cream Bar for old-fashioned sodas and ice cream sundaes (think soda jerk); La Palma for great burritos/quesadillas and any sort of Mexican sodas (Mexican coke! )/treats (its a small grocery/taqueria); Bi-Rite Market for edible souvenirs/picnic food (I highly recommend a picnic in nearby Dolores Park if the weather is nice); Bi-Rite Creamery for decadent ice cream after your picnic in Dolores Park, Flour and Water or Pizzeria Delfina for exceptional pizza and pasta, Mission Chinese for inventive Chinese food (just be prepared for a wait - or go the smart route and go on a weekday or for lunch); All Spice (in San Mateo - it's about 20 minutes south of San Francisco) for Indian fusion in a beautiful setting; Camino in Oakland for any of their Monday night prix-fix dinners, or really any night (another place for good cocktails); The Paragon in the Claremont Hotel in the Berkeley Hills for drinks(though you're really paying for the wonderful view of the Bay); Smuggler's Cove for a bit of kitsch (it's tiki themed and there's a waterfall) and truly some of the best cocktails I've ever had; Hog Island Oyster Co in Pt Reyes (about an hour/hour and a half north of San Francisco) for super fresh oysters, great charcuterie, bread and cheese, beer and wine (it's a sort of picnic setup); Sol Food in San Rafael for Puerto Rican food and the best super tart lemonade; Miette for adorable pastries and high-end candy/chocolates; and finally I’ll second the recommendation to check out Tartine (you won't want to miss their pastries or croque monsieur), though once again be prepared for a LONG wait. PS I've been meaning to make this tart for years as well - perhaps it needs to be bumped up on my list! I'm not a regular visitor to LA but I can easily recommend a fantastic soul food joint in Santa Monica called The Galley. Above the entrance there is a dinghy carrying a female mannequin holding a wine glass and wearing a pirate hat, which tells you all you need to know about the kitschy vibe of the place. But the service is some of the best I've ever had in a country with pretty spot on service across the board (thats what tips equaling 50% of a hospitality salary does) and the food is hearty and magnificent. Made two of these little beauties for a friend's dinner gathering - there were only crumbs left - rather hard to cut unless you have a sharp knife but that didn't stop us devouring it ! Yum! Yes, it does need a proper kitchen knife to cut it - thanks for pointing that out. Glad you all liked it!